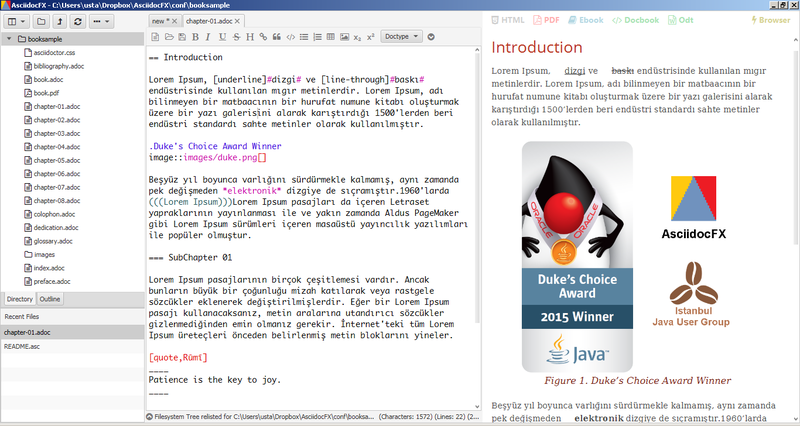 AsciidocFX is a Java-based editor for building PDF, ePub, MOBI and HTML books, documents and slides. Documents are written in AsciiDoc markup, where formatting and document elements are entered in plain text (*bold*, _italic_ and so on). You don't have to understand AsciiDoc to get started. There are toolbar buttons to make text bold or underlined, add bulleted lists, images, quotes and more, keyboard shortcuts like Ctrl+B and Ctrl+I work just as they always did, and you can import images by dragging and dropping (in theory, anyway- this doesn't always work). As you're working on your plain text markup, a separate Preview pane updates in real time to display the finished results. This isn't too unusual, but AsciidocFX gets more interesting with its addons. There's support for inserting multiple chart types (pie, bar, line, area, scatter, bubble, stacked), mathematical equations via Tex or MathML, UML diagrams via PlantUML, an "ascii art to bmp converter" for simple diagrams, even a quick and easy way to list the subfolders and files in a folder tree (just drag and drop the root folder onto AsciidocFX). Export options are another highlight, with AsciidocFX able to save your finished document as HTML, PDF, ePub and MOBI ebooks, and more. Markup editors don't appeal to everyone, but AsciifoxFX's unusual extensions and strong selection of export formats could make it interesting to academic and technical users.